Description: Following in the footsteps of Lewis and Clark, John Hoganson and Ed Murphy lead readers on a geologic tour of the Missouri River valley in western North Dakota, explaining the geologic wonders that Lewis and Clark recorded in their journals-burning coal veins, petrified trees, cannonball concretions-as well as more modern discoveries such as dinosaur fossils. Color photographs, maps, and paintings complement the explanations of the geologic features exposed in highway roadcuts and along the riverbanks and bluffs. You'll learn the origin of the Knife River flint that American Indians traded across the Great Plains, the source of the pumicelike rocks that float on the water, and the history of North Dakota's only offshore oil well-in the middle of Lake Sakakawea. 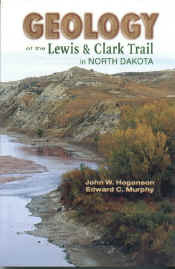 Geology of the Lewis and Clark Trail in North Dakota includes a history of the scientific objectives of the Lewis and Clark Expedition, an overview of North Dakota geology, a glossary, a bibliography, an index, 150 color photographs and 25 color maps.